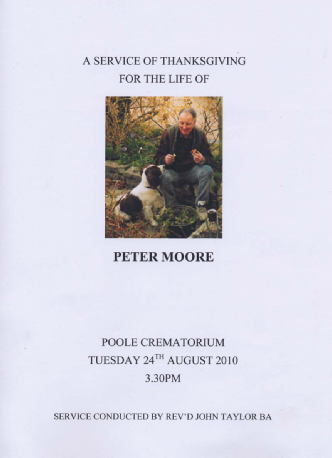 Peter's funeral, held at Poole Crematorium on 24th August was a very sad but fitting occasion. About 45 of Peter & Helen's family and friends attended, along with Ron McConkie, Colin & Miriam Rouse and Shirley & me. During the eulogy Peter was described as a "Gentle man and a Gentleman" which I thought was an excellent description. At the end of the service we all filed by Peter's coffin and his ex-84th friends stood to attention in silent farewell and tribute. We all saw the support that Helen is getting from her son & daughter and other relatives so we're sure Helen will not be facing the future alone. Many thanks to everyone who has sent a donation. In all there were 10 envelopes to pass on to the funeral directors.